Stanley Picker Gallery and our sister venue, Dorich House Museum are pleased and excited to be again collaborating with Kingston University’s Dance programme on a new body of performance inspired by the life and times of Dora Gordine. Level 4 (first year) BA Dance students visited the museum as part of Dancing Histories – a module in which students consider the historical contexts that gave rise to and changed dance practices, the dancing body and dance performances – and rethinking these through practice, discussion and academic research and writing. 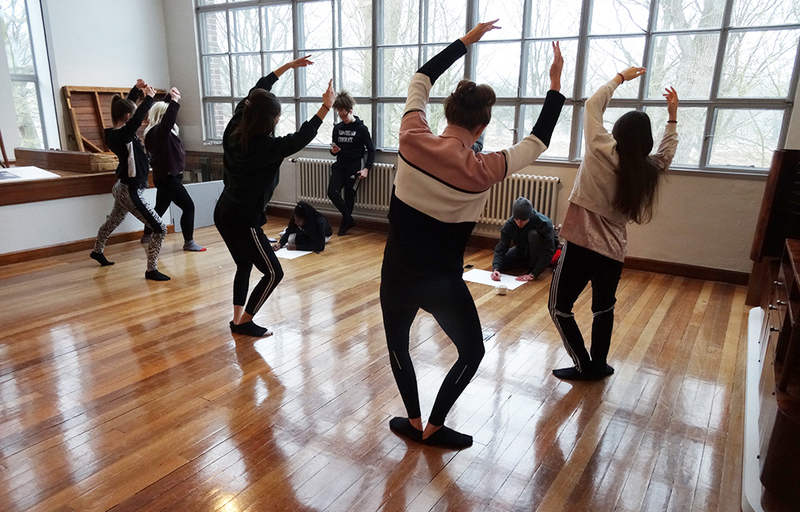 In the first of their workshops, dance students undertook a guided museum tour, in which they handled Gordine’s bronze sculptures of dancers and attempted to recreate some her most ‘imaginative’ forms. They also ‘sculpted’ each other and made observational drawings of the outcomes, and generated free writing to capture first impressions. The group met professional flamenco dancer, and museum guide, Christine Goodwin who offerer her personal interpretation of Gordines’ Esso commission ‘Power’ (1960), said to have been modelled for by fellow flamenco dancer (the notorious) Trader Faukner. Christine also shared fascinating research into Richard Hare’s telling of Arabian nights at parties, and while demonstrating actions relating traditional Indian movements and flamenco, explained how each has it’s own unique narrative, that inform both the character of the dancer and the response of any observer. Dancers, under the tutelage of course lecturer Beatrice Jarvis, were then challenged to team up in small groups to create 2-3 minute site-specific sequences inspired by their experiences and new-found knowledge of the story of the house, and life and practices of Gordine and Hare. Like history, key movements and moments became intertwined. Dancers, workshopped their ideas, and shared their pieces in a private performance for their peers, before gathering visiting members of the public for a (welcome surprise) alternative and visually interactive journey around the house – “it was wonderful”. While the extended tour was documented by staff and students, and will shortly be made available online, it is our hope to re-stage a public tour during the summer term.